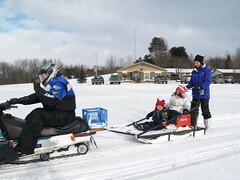 Winter Festival will be held for families at the Cedar HillToppers Snowmobile Club on Sunday, January 24, from 1-3 pm. Bring your winter toys, take a snowmobile ride, and roast marshmallows by the bonfire. Great family fun, fresh air, and exercise! Here is a map to the HillToppers Snowmobile Club at 7949 S. Schomberg Rd from Google Maps.